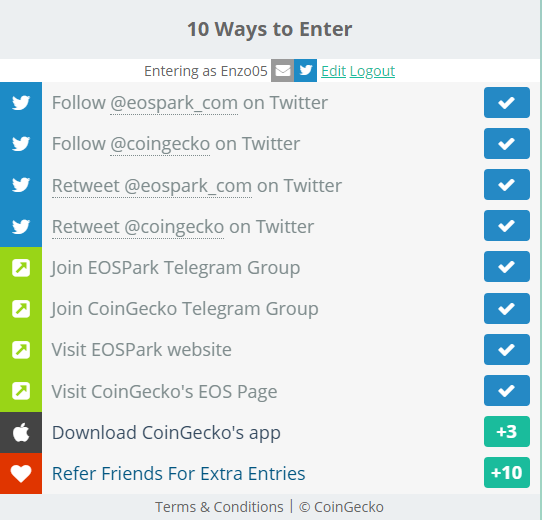 Referrals / [REFERRAL] COINGECKO AND EOSPARK 100 EOS TO 25 PEOPLE GIVEAWAY ! 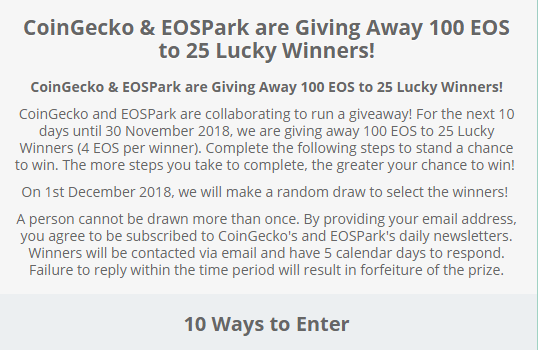 CoinGecko & EOSPark are Giving Away 100 EOS to 25 Lucky Winners! So everybody like giveaways and if your lucky enough to be selected as one of the winners then congratulations ! This is run by coingecko similar to coinmarketcap and EOSPark for EOS community to track/search transaction/account or even tokens under EOS platform . You can earn entries in 10 ways . Please go to : https://wn.nr/Rwgyk5 to proceed . Thanks guys and Happy Earning ! I think this is not airdrop, I called it signature campaign. Just like Onion coin in the past. Any way , thank you for share this. 5. 80% Holding Requirements to qualify for the airdrop. 6. Distribution 1 User = 1 Stake, Equal Distribution. 1. Registration Using VPN,TOR,Proxy is allowed but user that register using those methods will NOT QUALIFY for the airdrop. 2. Use your normal house internet connection or mobile data to register for the weekly airdrop. 4. We have BOT and Manual Checking in place to prevent cheating and abuse from the airdrop. "Looking for legit airdrop ? Well crypto soul is here to give you terrific airdrop ! " What is crypto soul ? It is a free-to-play online survival game. The player gets tokens for battle achievements, which are valuable in the real world. Why participate in crypto soul airdrop ? - It's already in coinmarketcap but it will have ICO in late November 2018 . 2. Simply follow task as shown in the image below . 3. Verifying your identity gives you more stakes and inviting your friend will give you 30 stakes/points (referral must be verified ) .